We are so thrilled to announce that in 2017 the national institute for Health and Care Excellence (NICE) announced that it will allow advanced pancreatic cancer patients in England access to the life-extending drug. Nice overruled it’s rejection of Abraxane in 2015 after a revised agreement on the price of the drug and comprehensive evidence about the impact on patients’ quality of life. November 2015 by Pancreatic Cancer Action, ultimately aims to get the Department of Health and NHS England to reinstate Abraxane®, a breakthrough life-extending drug for the treatment of advanced pancreatic cancer that has been removed from the Cancer Drugs Fund. NICE also announced that they were not going to approve the use of Abraxane® for NHS patients in England. The printed adverts feature Larry Rees, a terminal pancreatic cancer patient, who has benefited from the drug. 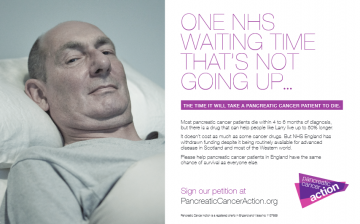 With the headline ‘One NHS waiting time that’s not going up…the time it will take a pancreatic cancer patient to die’, it highlights the benefit of Abraxane® as a treatment option and the fact that English patients are left significantly disadvantaged, with patients in Scotland and Wales being able to routinely access the drug on the NHS. The average life expectancy of pancreatic cancer is just four to six months. Trials have shown that the life expectancy of patients who are treated with Abraxane® can be improved by up to 50%. Oncologists have also said it can improve the symptoms of pancreatic cancer, including minimising pain and weight loss. There was also a demonstration outside the Department of Health offices, with two advertising vans promoting the powerful visual campaign. Demonstrators, including members and supporters from the Pancreatic Cancer Action, Nic Dakin MP and Nick Thomas-Symmonds MP, were encouraging the public to support their campaign by signing a government petition initiated by Pancreatic Cancer Action. Ali Stunt, chief executive at Pancreatic Cancer Action and rare survivor of the disease, said: “ It is so important that pancreatic cancer patients have access to the very latest treatments, especially those which can offer patients and families valuable extra time. Abraxane® has been shown in clinical trials to offer metastatic pancreatic cancer patients, on average, an additional two months’ survival, but in some cases, patients are surviving over two years. To remove access to patients in England, where the majority of pancreatic cancer patients reside, is cruel and unfair. Pancreatic Cancer Action is committed to working towards improving earlier diagnosis and better treatments for pancreatic cancer. The charity is focused on educating the public and medical community as well as funding research. They also campaign for more funding from the government into research, which currently stands at just over one per cent of all cancer research funding. For more information, please visit www.pancreaticcanceraction.org.